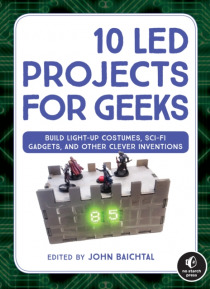 10 LED Projects for Geeksis a collection of interactive and customizable projects that all have the humble LED in common, but don't write them off as basic! You'll learn how to make challenging and imaginative gadgets like a magic wand that controls lights using hand gestures, a pen-sized controller for music synthesizers, a light strip that dances to the beat of music, and even an LED sash that f… lashes scrolling text you send from your phone.Every project includes photos, step-by-step directions, colorful circuit diagrams, and the complete code to bring the project to life. As you work your way through the book, you'll pick up adaptable skills that will take your making abilities to the next level. You'll learn how to:- Design versatile circuits for your own needs- Build and print a custom printed circuit board- Create flexible circuits which you can use to make any wearable you dream up- Turn analog signal into digital data your microcontroller can read- Use gesture recognition and wireless interaction for your own Internet of Things projects- Experiment with copper tape and create circuits with paper and foil- Build "e;smart"e; gadgets that make decisions with sensorsIf you want to experiment with LEDs and circuits, learn some new skills, and make cool things along the way, 10 LED Projects for Geeks is your first step.